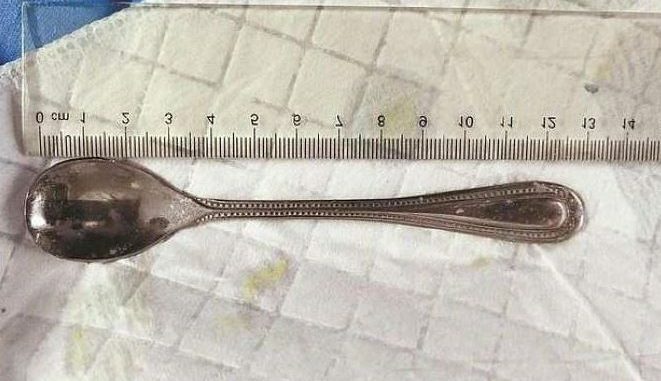 A woman in China was asked to undergo a surgery after she accidently swallowed a metal spoon when she was using it to dislodge a fish bone stuck in her throat. The woman going by the name Lili, left the 13-centimetre long utensil in her body for at least four days because she didn’t experience any pain or discomfort. Following an X-ray and an endoscopy – where a tiny plastic tube with an attached camera is inserted in the patient’s body – doctors in Shenzhen retrieved the utensil from the patient’s duodenum. The careless woman swallowed the stainless steel spoon on April 5th during the Qingming Festival. She thought it was too much trouble to go to the hospital during the public holiday. In a 10 minute procedure, the spoon was retrieved vertically from the woman. The doctors said that the metal object had caused some swelling and erosion in the patient’s duodenum. The woman was discharged from hospital following treatment. 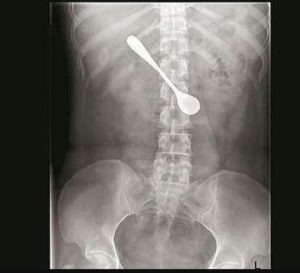 Swallowing spoons in China is not unusual, in October 2018 an eight-inch spoon from a 26-year-old patient after he swallowed it during a drunken bet. Again in September 2015, surgeons successfully removed a six-inch metal spoon from a woman after she swallowed the utensil while eating her noodles ‘too quickly’. In June 2015, a student swallowed an ice cream spoon measuring just over five inches when someone knocked into her.